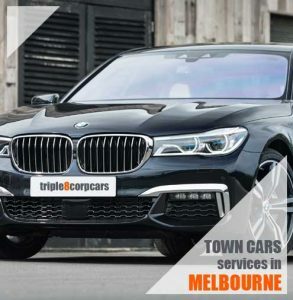 Whether it is a busy Monday morning meeting with your boss or a corporate lunch at the Melbourne Marriot, we are here to make sure that you get the most reliable town cars service in Melbourne has to offer. We also offer chauffeur car ride sharing for the convenience of our customers. with this town cars service of the chauffeur car ride sharing one can easily reach their destination with reasonable charges. If you are running late at the club you can call us to ensure a safe and secure ride home. If you have an important appointment to keep we will make sure that we get to your destination on time. If you want to impress a date we will make sure that all your needs are met with or without the extra hassle of planning and waiting for a taxi. We have a range of town cars and limos on offer so we can suit the needs of a group of any size. More importantly, we want to offer you a personalized experience so let us know of any special requirements that you might have and we will ensure that it is done before you receive the pickup or drop off. We also offer limousine services for events and concerts that will make sure you travel in utmost comfort and with impeccable style. Keeping affordability in mind we have designed our services in such a way as to be able to cater to all your needs without the additional frills and costs. Our Melbourne town cars are clean and hygienic, smart and practical and if you wish luxurious and stylish as well. We are here to make sure that all you require is done. Because punctuality is very important to us, you can rely on us for any event. Be it a meeting or a date, our drivers who are specially trained in safety and efficiency will be able to take you safely to your destination. Most importantly, we ensure that our Melbourne town cars meet every safety standard in the book so that you can have a worry-free and relaxed experience in Melbourne. Even if you want a car for a brief sight-seeing tour of the city, book with us to make sure that you have a truly memorable, secure and efficient experience.